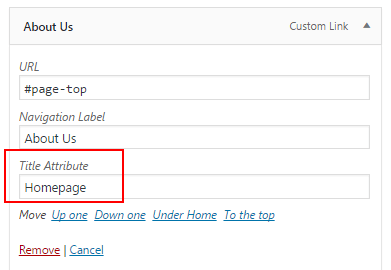 The purpose of adding title attribute in the menu navigation is to show the additional information about the page or the link in your site.It enables the web browser to display the title attribute on mouseover. This will allow the user to see where the link will take them before they click on them. Go to Appearance > Menus and click on the “Screen option” tab in the top right corner of the screen. This will open a menu here click on the check box next to title attribute option. Now click on any menu structure item. You will see a new field is added to it which is “Title attribute”. After this, you will easily add any title attribute text which you want as a title and repeat it for all the menu items of menu navigation. Click on the save menu button to store your changes and visit your site to see the title attribute displayed as a tooltip. Hope this article will help you for adding this amazing option in your WordPress menu navigation. For more queries related to WordPress visit to our support form.